Filling System Containers held in place by lateral belts pick up the caps that are screwed in place by rotary tangent discs. Cap Hopper We offer vibratory and inclined hoppers; these are normally activated by a cap level sensor installed in the cap feeder. Caps Under Demand (optional) A fiber optic sensor activates or shuts down the cap feeder according to the demand of caps under operation. Bottle Gripper Belts Standard equipment comes with one set of belts; we also offer multiple belts (2 or 3 on each side). Material, size and separation of the belts are custom designed for each customer. 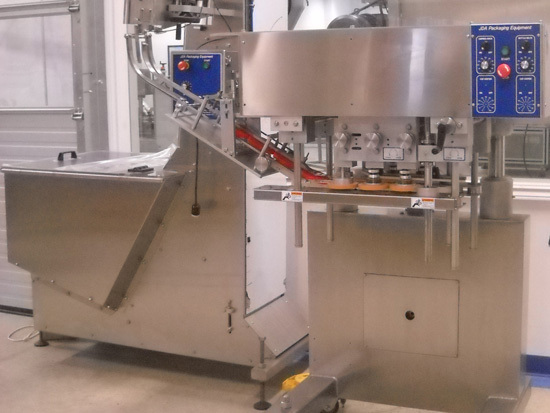 Electric Panel In this panel you can control each machine function independently: Capping discs speed, gripper belt speed, cap sorter speed and cap hopper vibration or speed. Torque Adjustment (optional) Individual adjustable clutch can be installed on each capping disc. This will improve torque control, disc life and will minimize cap marking.